Dozens of rusty barrels and plastic tubs filled with a dark, oily liquid clutter a muddy yard where chickens roam. More brimming containers are packed into a wooden barn. The property in northern Serbia, located next to farmland and a railway line, stored about 100 tons of likely hazardous waste altogether, the country's environmental protection ministry said on Thursday. Authorities found it last month, along with another big batch cemented into the walls of a nearby brick factory. "People actually buried hazardous waste in their own yards as if it were some kind of hidden treasure," Trivan said, "this has to stop." Andjelka Mihajlov, an environmental scientist on the Serbian government team working to revise the country's laws to be in line with EU membership, said the potential damage that hidden toxic hazards pose to the country's people and environment cannot be estimated. It depends on factors such as the type of substances and where and how they were stowed. Authorities say that out of the more than a hundred companies registered in Serbia to handle hazardous waste, only about a dozen followed proper labelling, storage and disposal regulations. Instead, many waste management firms pocket the money companies pay them and abandon loads that were supposed to be shipped abroad somewhere in Serbia. 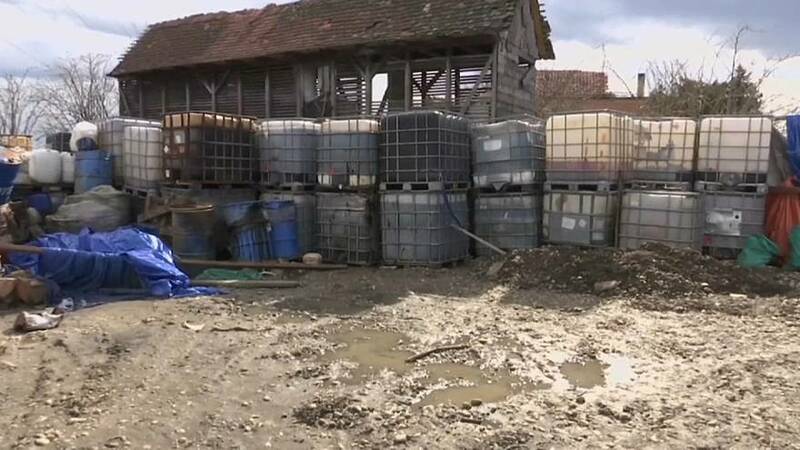 Officials suspect that was the case with the barrels and plastic tubs found on the property in the town of Pancevo in mid-March. Residents of a village near the Serbian capital, Belgrade, were warned not to use their wells after dozens of barrels of toxic waste containing carcinogenic benzene were found buried in Obrenovac. The property owner was arrested and faces a prison term of up to five years if convicted of illegally storing dangerous substances. Serbia also has unaddressed environmental problems with its waste water; all Serbian cities and many factories dump it straight into rivers. Air quality, drinking water safety and pollution from mines and power plants are worries as well. "We will continue persistently to search every location where we suspect the hazardous waste exists," Trivan said, "And that is the way we can make our environment clean and healthy."